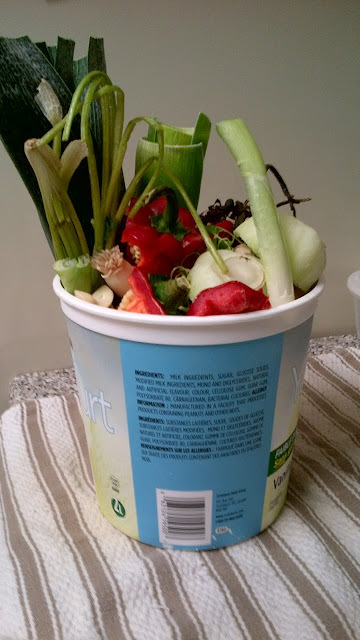 I have never been to culinary school so there is probably a proper way to make stock that I don`t know about but I find this method easy and cheap. I can`t bare the thought of chopping up a bunch of good, edible veggies, boiling them all day then throwing the veggies out. It`s too wasteful. I don`t have the cash to justify that kind of action. Instead, I keep a big ice cream container (not my ice cream, my husband would eat it a while ago so I saved the containers) in my freezer. When I chop up veggies through the week, I take the best trimmings and add them to the container. Ideal trimmings can be anything really but mine include pepper middles, herb stems, tops of leeks, mushroom stems, celery leaves etc. Be sure to wash well and don`t add anything spoiled, rotten or moldy. 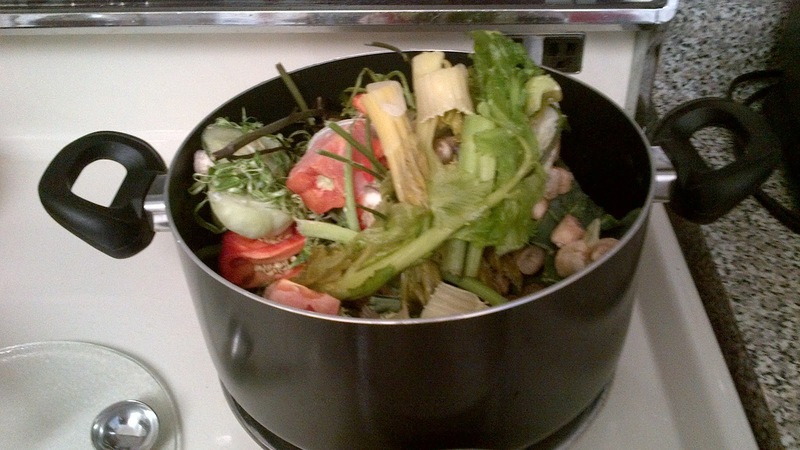 When you have a good pile of veggies, add them to a stock pot with ample water and 2-3 bay leaves. I use the broken up bay leaves because you will not have to fish these out anyway so it is a good time to use them up. Bring the whole thing to a boil then turn down the heat to a simmer. Simmer until half the water has evaporated and your done. You can salt as desired or maybe use some lemon pepper instead if you are avoiding salt.